Peptide secondary structures mediate a variety of biological processes and provide design cues for the development of new therapeutics. Unfortunately, removal of peptide domains from the context of larger proteins compromises folding and stability. 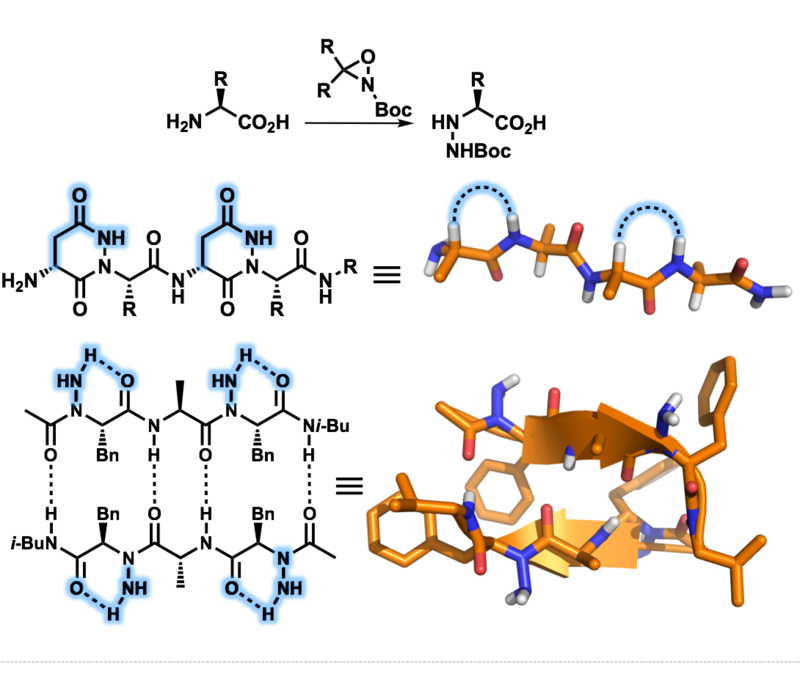 Our lab is pursuing N-heteroatom-substituted peptide foldamers and covalently constrained peptide mimics capable of recapitulating the structural features of protein domains. We are especially interested in developing efficient synthetic routes toward ​β-sheet mimics, stabilized polyproline II helices, and constrained α-helices, and in parsing the impact of discrete chemical modifications on conformation. In addition to traditional covalent tethering, our designs aim to utilize both stereoelectronic effects and non-covalent interactions to influence peptide structure. These principles can then be used to design hybrid or 'artificial' biomolecules with protein-like function. Nature remains a prolific source of biologically active drug candidates, with almost half of all FDA-approved therapeutics classified as natural product derived or inspired. Non-ribosomal peptides (NRPs) represent a particularly promising class of natural products with diverse biological activities. These structurally complex peptides are predisposed to interact with protein receptors and often feature drug-like properties not typically seen in canonical eukaryotic polypeptides. We are pursuing the synthesis of NRPs in which unusual amino acid residues or unique backbone modifications are important for biological activity. Total synthesis provides a platform for the development of new tactics/methodologies as well a launching point for structure-activity relationship studies. 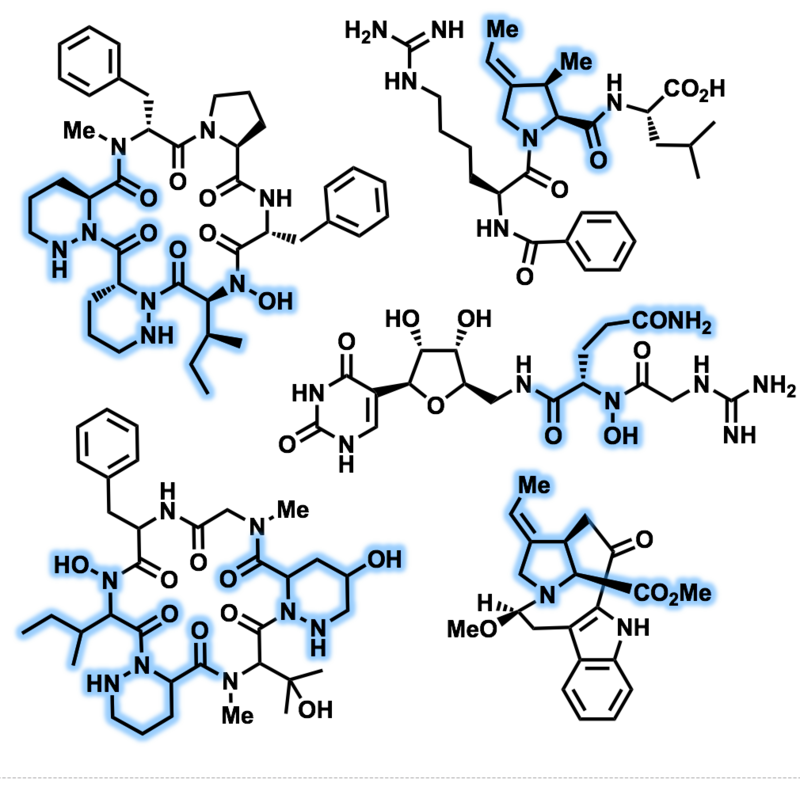 Perhaps more important, we are interested in leveraging synthetic access to unusual amino acids in order to study their effects on native peptide conformation and their utility in other drug design applications. Despite the importance of well-defined protein-protein interactions (PPIs) in promoting various diseases, the development of molecules capable of modulating these interactions remains a significant challenge. 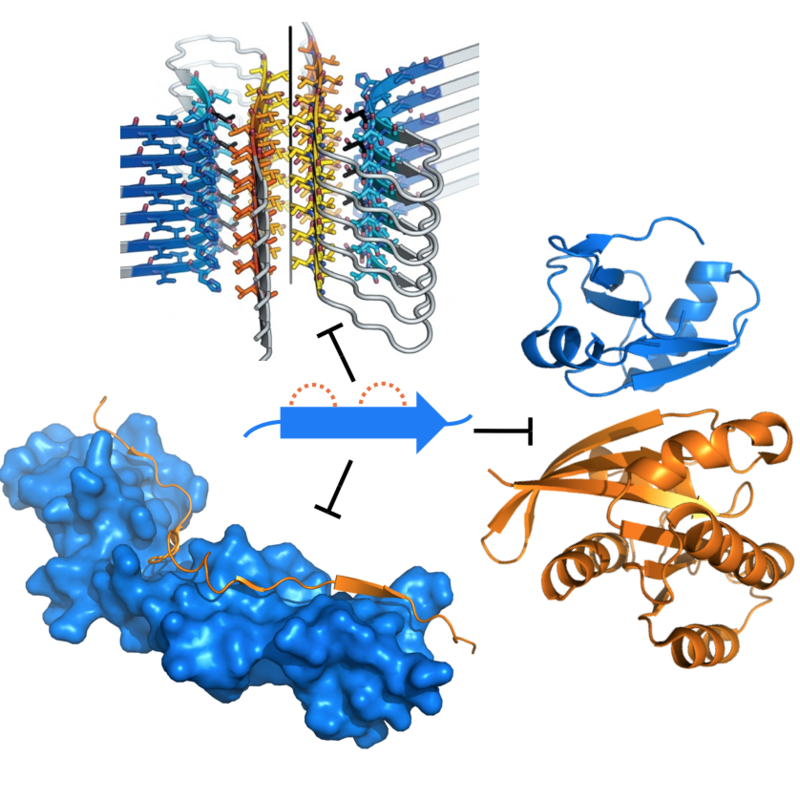 This situation stems from a chemical biology paradox in which the need to bind large protein surfaces with precise topological requirements is beset by the flexibility and cell-impermeability of high molecular weight inhibitors. Our lab is targeting a number of PPIs using designed protein mimics. Our focus is on β-sheet interfaces that present unique challenges due to their large polar surface areas and diverse modes of recognition. Efforts in this area include disruption of neurodegenerative protein aggregation as well as PPIs that drive cancer. These projects involve the chemical synthesis of inhibitors, development of biochemical assays, and lead optimization guided by downstream biological and physiochemical studies. The endoplasmic reticulum (ER) stress response is activated upon exposure to various stress stimuli and is crucial for regulating cell survival. Cellular stress resulting from gene amplification and aberrant protein expression is an established hallmark of cancer. As a result, many tumors hijack this response mechanism in order to evade programmed cell death. 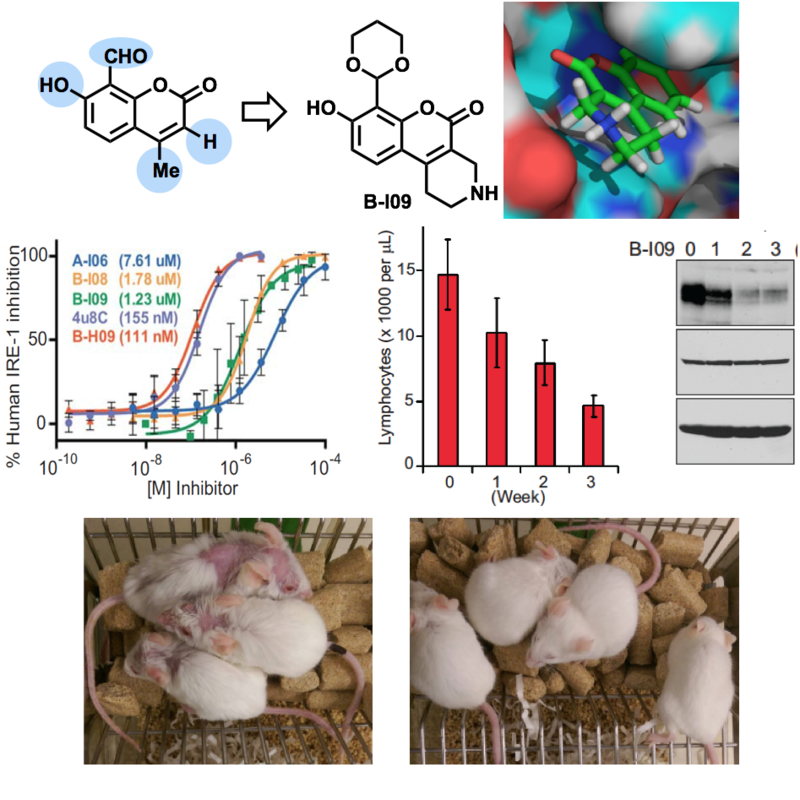 As part of a highly collaborative effort with immunologists, cell biologists, and clinicians, our lab has developed a series of potent small molecule inhibitors of the IRE1/XBP1 signaling arm of the ER stress response. These compounds have helped to establish the clinical relevance of targeting IRE1 in a variety of disease models including chronic lymphocytic leukemia, c-Myc-driven cancers, and graft-versus-host disease. Current efforts are aimed at chemical optimization, advanced preclinical development, and elucidating the role of ER stress response in other diseases using new chemical probes.